Ramagiri is a small village, famously known as Ramagiri hills which is a rocky hill formation interspersed with dense vegetation located in Chittoor District, Andhra Pradesh state of South India near the border of Tamil Nadu state. This place, also called Kaalinga Madu Karai or Thirukkaarikkarai is about 5 km from Nagalapuram. Ramagiri is a beautiful and scenic place nestled between mountains and sylvan scenery. It is surrounded by a lot of green and fresh fields. A calm and serene site with no major buildings, shops, or houses nearby. Vamadheva face: Sampangi rameshwarar Vamadhevapuram alias Arani near Periyapalayam (not North Arcot). Sathyojaatham face: Varamoorthy Kshethram alias Ariyathurai. Ramagiri village has two temple - one Subramanya temple at the top of the hill, and another at the base of the hill. The Subramanya temple at the top of the hill is a new temple built in 1969. The temple located at the base of the hill is Valeswara temple (or Waleswara temple), which has many legends associated with this. This hamlet is amongst picturesque mountains and is also as known as 'Bhairava', due to the presence of a Kaalbhairava Temple here. Bhairav of this temple is also called as Santana Prapti Bhairava. It is believed that if the childless couple worship Bhairav of this temple, they will be blessed with child. As per the legend, Lord Rama wanted to perform pooja to Lord Shiva in Rameswararm in the Southern Tamil Nadu. He ordered Lord Hanuman to bring an idol of Shiv Linga from Kasi in North India. When Hanuman was returning from Kasi via Ramagiri, Lord Bhairav used his power to make Hanuman sweat and get tired. Hanuman wanted to have water and saw a pond in this site. He handed over the Shiv Linga to a boy without knowing the fact that it was Bhairav. When he returned to take back the Shiv Linga after having water, he found the Shiv Linga installed on the ground. He tried his level best to lift the idol in vain. Ultimately, he cursed the pond to become a hill and went to Kasi to take another Shiv Linga. It is believed that the hill that was created due to curse of Hanuman is Ramagiri. As the Shiv Linga idol was pulled by the tail of Hanuman, it got the name "Valeswara". In Telugu (also in Tamil) language, "Vaal" means "tail". You can find the Shiv Linga idol slightly tilted even today. There is however another story associated with the same temple. This is associated with the Vanara King Vaali . Vaali had the Habit of doing the Sandhya ablutions in the nearby oceans and the sea in the earlier days was much closer to the present day Temple. On seeing the Lord Shiva manifesting himself there in Swayambhu Linga form, Vaali wanted the same to be installed in his Capital Kishkinta, (the present day Hampii) and tried to take the statue. However he failed in his efforts how much ever he tried. So in a fit of anxiety,he tied his Tail (Vaalam) around the Linga and tried uprooting the same. And Lo! and behold.. He fell down losing all his energy and power and then realised the sacrilege that he had committed. Then he prayed to Lord Shiva and begged for forgiveness of his act. The lord ever so beneign appeared with his consort as a Gypsy complete with dogs etc. and camping outside the temple, taught Vaali the process to regain his energy. The Lord also created this Tank and said whosoever takes a ritual bath in this tank and worships him would regain sound health and lost strength and to this day this tank water has such properties. The statue that we can still see opposite the Lord in the main temple believed to be that of Hanuman is actually Vaali ( Hanuman being Shivamsa would never have committed such a sacrilege). The Durga idol that we see also is in the Vaamachara pose signifying rectification. The same is also corroborated by the fact that Vaalam being tail, the name would be Sree Vallameswarar and not Vaalieswarar. This name is gotten by the fact that the Lord being the benefactor for Valli is aptly called Sree Vaali- eswarar. This temple also has an excellent Deity in Sree Dakshinamoorthy and Sri Shanmuga . A trip to this place is memorable indeed. Ramagiri Vaaleeswarar temple is believed to be built by Pallava king in the 9th century AD. Even though it is believed that the temple was built by Pallava king, the current structure of the temple doesn't appear to be of Pallava architectural style. However, the idols of the temple are extremely beautiful and they resemble the ancient idols of Pallava period of other temples. 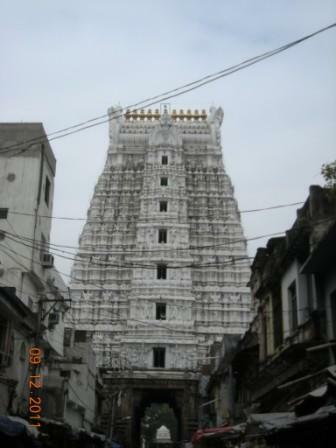 There is no Raja Gopuram (tower) or flag post in the temple. The temple is basically divided into two divisions. The first division has Bhairav as the main deity whereas the second division has Shiv Linga named as Vaaleeswarar as the main deity. 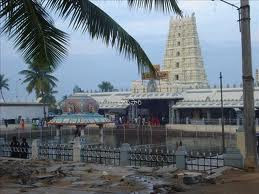 The temple pond which is situated in front of the temple, is called Nandhi Theertham. There is a small Shiva Lingam with a Nandhi nearby. Nandhi’s front half is seen protruding from the wall of the pond. 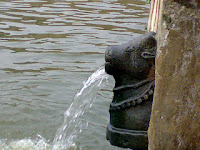 The water originating somewhere from the hill, reaches a small well and from there it passes and comes through this Nandhi’s mouth and flows into the pond. Native villagers say that they have never seen this water flow stop, since their memory. Also they are not sure about the source from where the water reaches Nandhi. It is supposedly of medicinal value in treating Neurological problems. Near the Nandi idol, you can find a small Shiv Linga idol. There is also a shrine for Lord Ganesha. Behind the shrine of Ganesha, you can find the steps that take you to the hill top temple of Subramanya. You can find a lot of temples in North India with Bhairav as the main deity. However, in South India it is very rare to find a temple with Bhairav as the main deity. This is one rare temple having a tall magnificent idol of Bhairav in the main sanctum sanctorum. You can find the idol of dog in front of the main shrine, as dog is the vaahan for Bhairav. Adjacent to Bhairav shrine, there is a separate shrine for the Goddess Kalikamba. The corridor surrounding the Bhairav shrine has small idols of Bhairav in various postures on the walls. The entrance of Bhairav shrine has two Shiv Lings and a Siddhi Vinayaka idol with a different look of trunk. The other part of the temple is dedicated Lord Shiva named as Valeswara. He is in form of a Linga slightly slanted. Opposite to him is a small Nandi idol and Hanuman idol. You can find Hanuman in front of Rama, but not in front of Shiva. Hence, this also becomes a rare idol. There is also another big artistically beautiful Nandi idol. The entrance of Shiva main shrine has two big idols of Dwarapalakas. Ganesha and Chandramouleeswarar (Shiv Linga) are also found in the entrance. The corridor surrounding the shrine of Valeswara has a lot of idols on the platforms and walls similar to any other South Indian Shiva temples. But the beauty of this temple is that each and every idol is carved in artistically beautiful way. These idols are definitely not something commonly found in the other temples. Each and every idol has its unique beauty with fine details. The idols of Brahma, Vishnu, Subrahmanya (Shanmuga), Veerabhadra, Durga, Surya, Chandikeswara, Sapta Mata, Dakshinamurthy, Ayyappa, Anjaneya, and Appar are found in the corridor. The idol of the saint Agastya found in a different posture; his head is covered with a hat like covering. There is an idol for Ganesha named as Gajamukha which is a fantastic example for Pallava sculptural style. The idol of Veerabhadra in the sitting posture is a rare idol. The idol of Ganesha near the entrance of main shrine is also looking different and very attractive. There is a separate shrine for the Goddess of the temple Maragadambika. The idol is big and attractive. 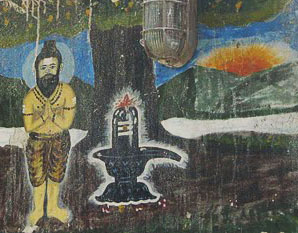 In the wall, you can find a small carving depicting the scene of Hanuman pulling the Shiv Linga. This temple is a calm and serene location where you will get the antique feeling and experience tranquillity. This temple is in Rama Giri, about 5 km from Nagalpuram, situated on the Chennai National Highway 55 km from Tirupati. Ramagiri can be reached either from Chennai or from the pilgrim site of Tirupati. It's located almost at the same distance from Tirupati and Chennai. Govindaraja Swami Temple in Tirupati quite near to the Railway Station and Tirupati Bus Stand. The highlight of the temple is its outer Gopuram which is visible from a quite a distance. This temple is dedicated to Sri Govindaraja Swamy brother of Lord Venkateswara. Govindaraja Swami Temple has two main shrines dedicated to Lord Vishnu and Lord Krishna. The shrine to the north is Sri Govindaraja. The shrine to the south is Sri Parthasarathi (Lord Sri Krishna as the charioteer of Arjuna). 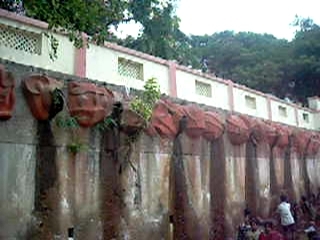 The idols of Rukmini and Satyabhama (Krishna's wives) are also found here. The original temple had Sri Parthasarathi on the main altar. 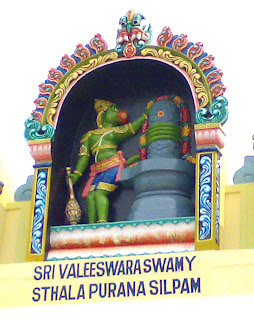 'Sri Ramanuja' added the Sri Govindaraja deity around 1130 AD. 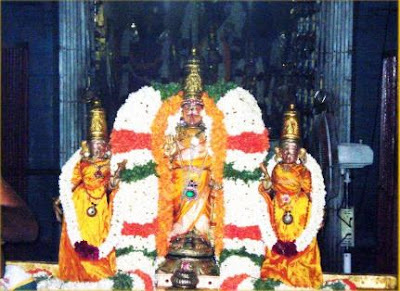 The presiding deity lord Govindaraja swamy is lord Vishnu, lying on Ananta. He is consider as brother of Lord Venkateswara. This temple is the biggest temple in Tirupati Town and attracts lakhs of pilgrims. A large number of inscriptions found in this temple and in the Sri Venkateswara Temple at Tirumala help us to trace its history. The earliest of the records belong to the year 1235 A.D when the Chola King, Raja Raja III was ruling the place. In the year 1239 A.D the queen of Viranarasinga of Yadavaraya made a gift for decoration of the chariot and carrying necessary repairs. The temple came in for greater importance in 1506 A.D. during the rule of Saluva dynasty of Vijayanagar and from then onwards different rulers in a different way developed the temple. 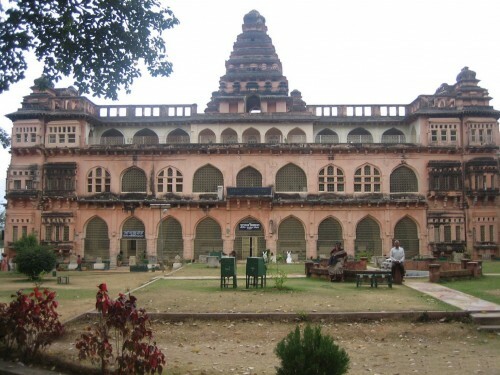 It is built by the Nayakas, the successors to the Vijayanagar empire. Govindaraja Swami Temple has a remarkable outer gopuram and an inner gopuram. The temple has an impressive outer gopuram. The inner most gopuram is the earliest one, dating from the 14th-15th centuries and has carvings that depict scenes from Ramayana and Lord Krishn's life. Few parts of the inner shrine date back to the 9th and 10th centuries. The original temple had Sri Parthasarathi on the main altar. 'Sri Ramanuja' added the Sri Govindaraja deity around 1130. Very interestingly, at the shrine the celestial bath (Abishekam) is not conducted to the presiding deity perhaps first of its kind in India, a source said that the deity of Lord Sri Venkateshwara that is in lying posture is made of Clay. The TTD that manages the temple too has been contemplating to give golden touch to the deity. It has an imposing seven-storey 'Gopuram' built in 1628, which can be seen from a distance. To the left side of the entrance first Gopuram (gate) of the temple dedicated to Lakshmi is found. She is seated on a lotus in her four-armed form, holding a lotus in each of her upper hands, while her other two hands are in poses of 'Abhaya', fearlessness, and 'Varada', benediction. Another nearby shrine is dedicated to Sri Ramanuja and on the left of the second entrance is a 'Kurma' Deity, Lord Vishnu as a tortoise. There are carvings depicting the pastimes of the Ramayana and Lord Krishna's pastimes on the second gopuram. Govindaraja Swami temple in Tirupati very near to the Railway Station and Tirupati Bus Stand. Akasha Ganga Theertham is a popular sacred waterfall, about 5kms to the south of the Sri Venkateswara Temple. The waterfall is about 5 km from the main temple and the Tirumala Nambi family is allowed to take holy dip at this waterfalls. HOW TO REACH AKASHA GANGA THEERTHAM? 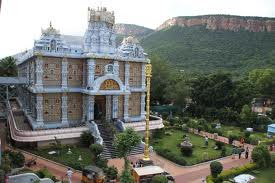 Some of the interesting places on Tirumala Hills like Gogarbham, Papavinasanam, Venugopala Temple are located on the way to Akasha Ganga Theertham. Pilgrims can visit these places taking an APSRTC bus or a Taxi. On an APSRTC return ticket (present fare Rs. 8/- valid for 5 hours) pilgrims can alight enroute at any place of their choice, catch another bus and proceed to the next destination on the same ticket. APSRTC buses are available from Kalyani Choultry near CRO from 5 a.m. to 7 p.m. every day with a twenty minute frequency. Taxis operate at a two-way fare of Rs. 25/- to Rs. 35/- per person for the two hour trip. This sacred pond has been referred in Skandapuranam and Venkatachala Puranam stating a holy bath in these waters would relieve one from the sins (Papam) attracted through their mortal lives and brings prosperity and peace. Hence this place is known as Papavinasanam (or Paapa Vinaasanam). Here the godess is Ganga. This place is on the hilltop of Tirumala, about 5 km from Tirumala Temple. People who visit Tirumala for Balaji’s Darshan will definitely make a trip to Papavinasanam. Those who’ve been visiting Papavinasanam at Tirumala since long recollect of a time when there were no openings in the wall to conduct the holy water that is said to emanate from thePapavinasanam river. Apparently the water used to stream down the height without any conduit channeling it down. It was only later that outlets were made in the wall to channel the sacred water to the convenience of visiting pilgrims, and seven outlets ensure there’re no long queues at the place. Adjacent to the bath is a dam that goes by the same name as the bath, Papavinasanam. It is one of the three dams the temple town sources its water requirements from, and is 255 metres in length with a catchment area of 8.44 Sq. Kms. The other two dams are the Akashganga, and the Gogarbham. It is almost the last place that a person can visit by road in Tirumala. Some of the interesting places on Tirumala Hills like Gogarbham, Akasaganga, Venugopala Temple are located on the way to Papavinasanam. Pilgrims can visit these places taking an APSRTC bus or a Taxi.